KNIME WebPortal is an extension to KNIME Server. The WebPortal provides a web interface that lists all accessible workflows, allows to execute them and to investigate the results. 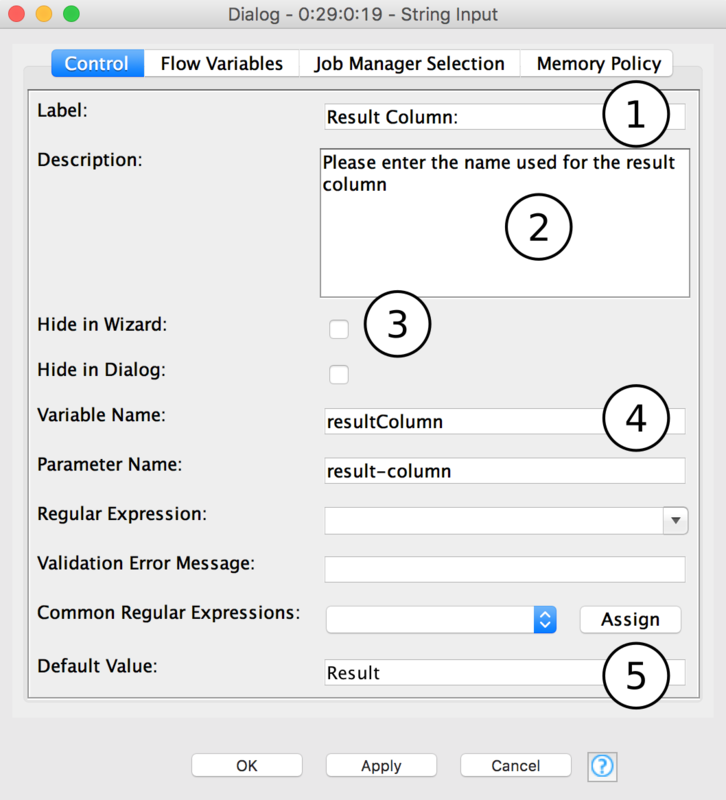 The workflows' input and output can be parameterized using "QuickForms". In addition, report templates created with KNIME Report Designer that are uploaded together with their associated workflow to the shared repository on KNIME Server can be filled dynamically with data and downloaded in various formats. 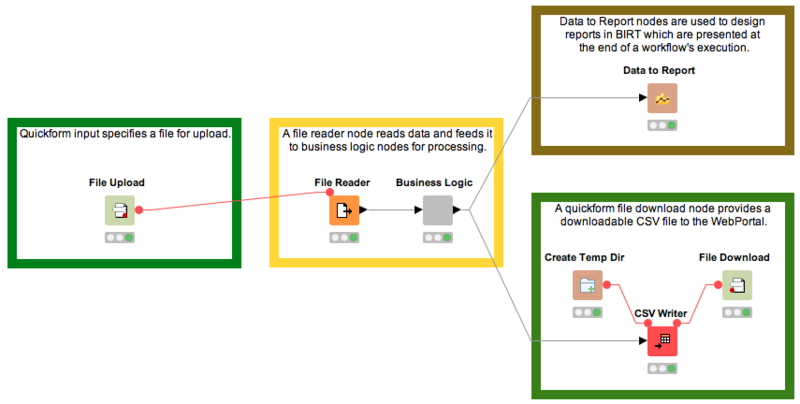 Workflows and the associated report templates are published on KNIME WebPortal by simply uploading the workflow from the local workspace to the server. This can be done either via the context menu in KNIME Explorer (copy/paste), or by dragging and dropping a workflow from a local workflow repository to a ServerSpace repository. Access permissions can be assigned to restrict the access to certain user groups. Please refer to the KNIME Explorer User Guide for more information. The last part of the address may have been changed by your server administrator. After providing the user’s login name and password, a listing of all available workflows is displayed. Only workflows the user can read and execute are shown. The nodes in the node repository category "Workflow Control → QuickForms" can be used to create flow variables and to assign them values. These values can then be used in the workflow to control the execution of nodes. There are different quick form nodes for different types of variables (e.g. "Integer Input", "String Input", "Double Input", etc.). QuickForm nodes are especially useful when used in workflows designed for KNIME Server deployment via the WebPortal. When the WebPortal encounters a QuickForm node in a workflow, it prompts the user to enter new values for its variables before proceeding with the workflow execution. The new values are injected into the workflow, and used to parameterize its execution. Imagine we want to show a workflow in the WebPortal that allows the user to convert an XLS-file into a CSV-file (comma separated values text file). The workflow is very simple: just connect an Excel Reader (XLS) with a CSV Writer. For the WebPortal, we add nodes to enable the user to upload the XLS-file and to download the result, and to write to a temporary location on the server. After the workflow is created it is uploaded to KNIME Server. This example demonstrates a common sequence of nodes used to upload and download data using KNIME WebPortal. In addition to the "regular" nodes used for reading and analyzing the data (center, yellow) there are additional QuickForm nodes (left and lower right, green) that provide the workflow with file import and export capabilities via a browser. Please note, that a functioning workflow needs to nest the QuickForm nodes into a Wrapped Node. This has been omitted in the picture, to better show the concept. 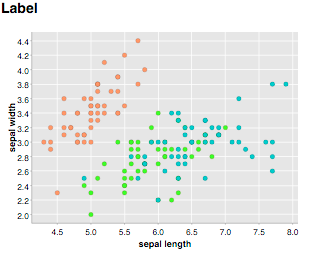 Finally, a Data to Report node (upper right, brown) is used to send data to a predefined BIRT Report. A date (as string) (or a selected date from the calendar form). User credentials (user name and password) for later use in authenticated nodes. Upload a file to the server using a temporary folder. Select one or multiple remote files, workflows or folders. Table with paths to selected items (as knime:// protocol). First path is also output as flow variable. Choice of the available values. The available selection depends on the node’s configuration. Empty data table with selected columns. Often used with Reference Column Filter. The flow variable specified must contain an absolute file path. The text displayed above this input field. The tooltip text seen on mouse over. The name of the variable that carries the value of this Quick Form node. 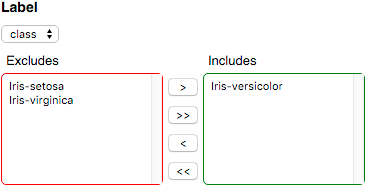 It should be a unique and will automatically be assigned a type. The default value assigned to the variable named above. Used both for workflow testing and as the default value in KNIME WebPortal. A workflow execution on the WebPortal is comprised of one or more pages or wizard steps, where a user gets guided through the process. Each page or step is modelled in the workflow by the use of Wrapped Metanodes. These nodes are an extension to Meta Nodes and can easily be created by selecting the nodes to be included in a page and selecting "Encapsulate into Wrapped Metanode" from the context menu. To dynamically show and hide pages during execution it is possible to disable a Wrapped Metanode, e.g. by means of an IF or CASE block. It is also possible to use Wrapped Metanodes inside loops for example to iterate over an item set or recursively refine a model. a layout consists of one or more rows. Each row can have up to 12 columns. a column determines the width of its components, therefore it can be resized when there is more than one column in a row. one or more views can be added to a column. For example, to layout two views side by side you could create two columns with either equal or unequal widths and add one view to each. All available views are initially inserted below each other into the layout. To add a view, drag it from the left panel (1) to the desired position in the layout preview. To add a column, click the '+' buttons in the layout preview (2). To resize a column, click and move the resize handle between columns (3). To add a row, drag a row template from the left panel (4) to the desired position in the layout preview. You can choose between different templates, e.g. 1-column, 2-column, 3-column; but you can also add and remove columns later on. To delete a view, column or row use the trash bin button (5). This is only available for columns and rows when they are empty, i.e. do not contain views, rows, or columns. To move a view into another column drag it to the layout preview. Complete rows can also be moved by dragging. Each view has default sizing settings which can be changed via the cog icons in the layout preview (6). Basically you can choose between automatic height based on the content of the view or aspect ratio sizing (16:9, 4:3 or 1:1). When using automatic height it’s possible to define minimal and maximal sizes. The layout structure is saved in a JSON format which advanced users can edit directly in the 'Advanced layout' tab. The layout is based on the framework Bootstrap and uses its 12 column-based, responsive grid system. For more information and documentation about Bootstrap please visit the Bootstrap website. The JSON format generated by the visual layout editor is shown in Figure 10. It’s a good starting point for understanding the structure and further customization and fine tuning. The summary below describes the JSON structure in a non-normative descriptive way. The numbers in parenthesis indicate where you can find the elements in the JSON format in Figure 10. A row is the outer most element that can be defined and is the first element inside the layout container. The JSON structure’s outer layer is an array of rows. A row contains a number of layout-columns. 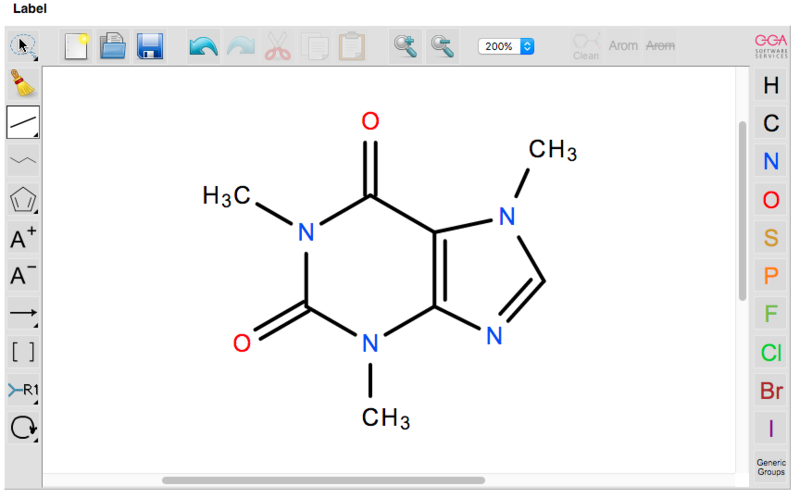 The grey line that appears in the custom view output of the Wrapped Metanode is shown in Figure 11. A column is a layout element inside a row which determines the width of its components. To define a width, a number between 1 and 12 (corresponding to the Bootstrap column widths) has to be used. 12 means taking up 100% of the width, whereas 6 would be 50% of the width. This way it is possible to define a layout with components side by side by providing their relative widths. E.g. if three components are to be laid out horizontally with equal column widths use a row with three columns of width 4. If the sum of widths for a particular row is larger than 12, the "extra" columns are wrapped onto a new line. It is also possible to define multiple widths of the columns so that they can adapt to the screen size. With this option responsive layouts can be achieved. To define the responsive width of a column, use at least widthXS and one or more of the following fields: widthSM, widthMD, widthLG which corresponds to the Bootstrap size definitions of XS, SM, MD and LG. 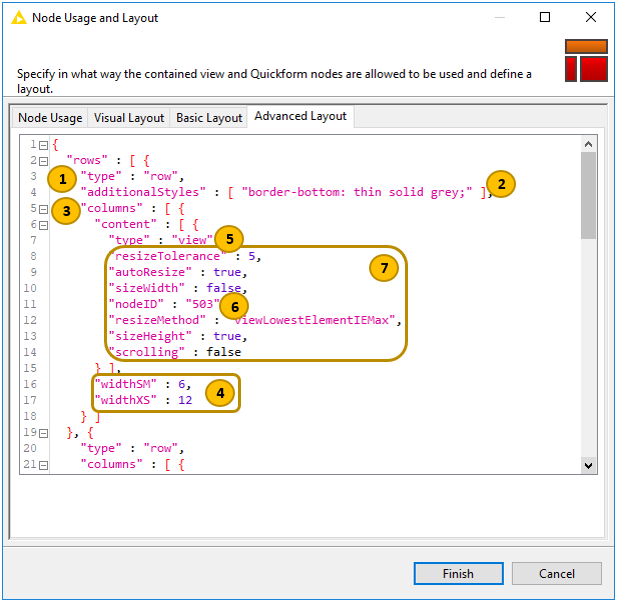 To embed the contents of a KNIME node inside the layout, a content element with type view has to be used. The element has quite a few ways to customize the sizing and behavior of the content, which are explained in the table further down. Referencing the node is done by the field nodeID (6), which takes the ID-suffix of the node as a string argument. If nodes exist inside the Wrapped Metanode which are not referenced by the layout, a warning message appears underneath the editor. Errors will also be issued for referencing nodes twice or referencing non-existing nodes. This method uses an iframe-resizer library to resize the iframe according to the size of its contents. This means that the content has to have a concrete size explicitly or implicitly set. determining the size is possible using different approaches, which are explained on the iframe-resizer GitHub page Size-based resize methods all start with the prefix view…​ in the JSON structure. If a node’s view is set to adapt to its parent’s size, rather then implicitly providing a size, the size-based methods will either not work or cause strange behavior. To allow these views to take up an appropriate amount of space in the layout an aspect ratio setting can be used. Here the width is taken as 100% of the horizontal space available at that position in the layout and the height is calculated according to the given ratio. To achieve this resizing behavior, Bootstrap’s responsive embed concept is used. Aspect-ratio based resize methods start with the prefix aspectRatio in the JSON structure. It is also possible to completely manually trigger resize events at appropriate times. This requires the node’s implementation to make the appropriate resize calls itself. Constrain the size of the iframe by setting a minimum width in pixels. Constrain the size of the iframe by setting a minimum height in pixels. Constrain the size of the iframe by setting a maximum width in pixels. Constrain the size of the iframe by setting a maximum height in pixels. Boolean only working with size based resize methods. Use this to enable or disable automatic resizing upon window size or DOM changes. Note that the initial resize is always done. Number only working with size based resize methods. Sets the interval to check if resizing needs to occur. The default is 32 (ms). Boolean only working with size based resize methods. Enables or disables scroll bars inside iframe. The default is false. Boolean only working with size based resize methods. Enables or disables size adaption according to content height. The default is true. Boolean only working with size based resize methods. Enables or disables size adaption according to content width. The default is false. Number only working with size based resize methods. Sets the number of pixels that the content size needs to change, before a resize of the iframe is triggered. The default is 0. Array of additional classes added to the HTML container element. Array of additional CSS style declaration added to the HTML container element. Quickform nodes in a workflow define points of interaction in a workflow when it is executed via the WebPortal. 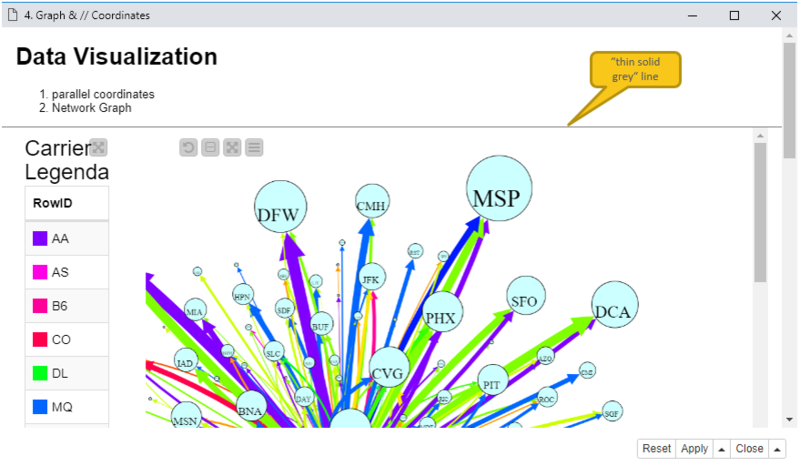 This allows skilled analysts to expose powerful tools to users who may not have the training or time to run a full featured workflow from KNIME Analytics Platform. This is usually done by injecting flow variables from the Quickform node into another node’s settings to drive the configuration of that node on a per setting basis. Variables created by a Quickform node are available at the node’s variable output port (circular and red). To use the variable, connect the Quickform variable port to the variable port of the target node whose settings you wish to override. If a target node doesn’t have a flow variable port you can make it visible with Show Flow Variable Ports from its context menu. Alternatively, connect the output port to the upper left corner of the node (a convenient shortcut). Build a workflow and execute it with relevant test data. Parameterize the workflow by adding Quickform nodes as needed. Use the variables generated by these nodes to override the settings of your target nodes. Make the workflow portable by removing any hard-coded paths. Reset the workflow, save it, and upload it to the server and set appropriate permissions. Prefix for the new folder. Unique names will be created automatically. 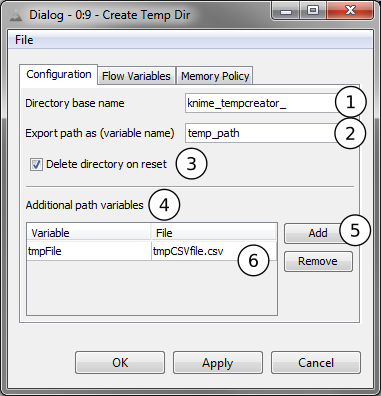 Flow variable to be created containing the absolute path of the new folder. If enabled, the newly created folder will be deleted when the node is reset (along with all contained files). Add a new variable and file reference. For each row in this table, a new workflow variable is created. The variable name is entered on the left and the file to be created on the right. The final variable will refer to the full path including folder and filename. With this node you can create temporary files (in unique temporary folders) and use them in writer nodes. If the variable that carries the name of the temporary file is then selected in a File Download node, the file written is made available for download in the WebPortal. Another node that could be useful when flow variables are used is the Java Edit Variable node. It allows you to modify the value of an existing variable or to create a new variable and/or derive its value from another existing variable. With the Java IF (Table) node you can selectively execute branches in the workflow, based on the value of a flow variable. Together with the String Radio Buttons node the KNIME WebPortal user could select different workflow branches for execution. A preview of the report is shown in the result page and the HTML preview can be opened in a new window. Download links are offered for PDF, XLS, PPT and DOC format. 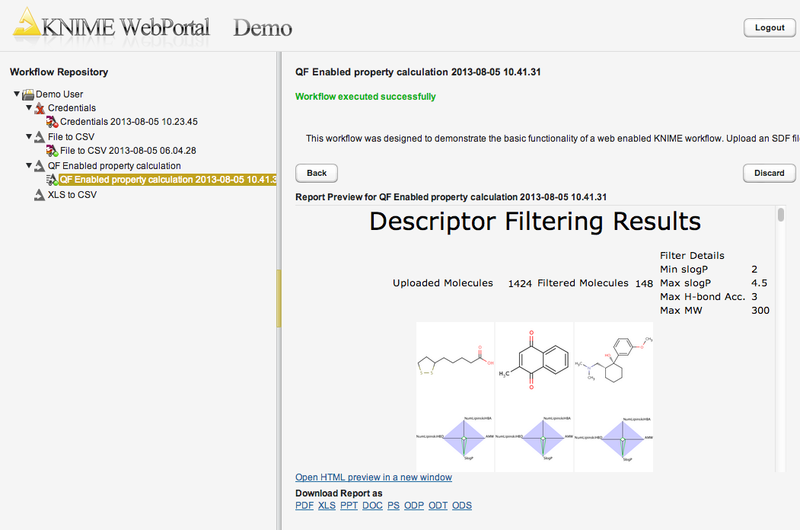 After logging in, the WebPortal main page is displayed showing the available workflows displayed in a structured list in the left frame of the page. Only workflows that are both readable and executable by the logged in user will be visible. In the above example the user has only access to the flows in the workflow group "Demo User" and four workflows are available for execution in the WebPortal. The items below a workflow (with a green or red indicator dot) are previously executed flows which are kept in memory ("workflow jobs"). They can be discarded individually with a right-click on the job, or with a right-click on the flow. Jobs with a green indicator represent successfully executed flows. If they are selected, the result from the previous run is available. Jobs with a red indicator represent flows previously executed but that have failed. If selected, the error message is displayed again. If a job itself is red, this indicates that the workflow has been modified since the job was executed while if the Workflow has a red x across it, this means that the workflow which owns that job has been deleted. If Meta Information has been entered before the flow was uploaded, it is displayed beneath the workflow name. If the option "Mail notification on completion" option is selected, an email address must be entered. The server sends a notification email to this address as soon as the workflow execution finishes. After all information is entered, the flow execution can be initiated by clicking the "Start" button. A new job is then created. If the job finishes the result can be inspected by selecting it in the left pane of the page. The example job shown below executed successfully (indicated by the green icon and the green line of text on the right). Beneath these status lines the result files are available for download. The workflow contains Quick Form nodes that provide the path to two files. If the user clicks on one of the links the download of the corresponding file starts. This example flow is generating a report. The preview is shown in the details pane. 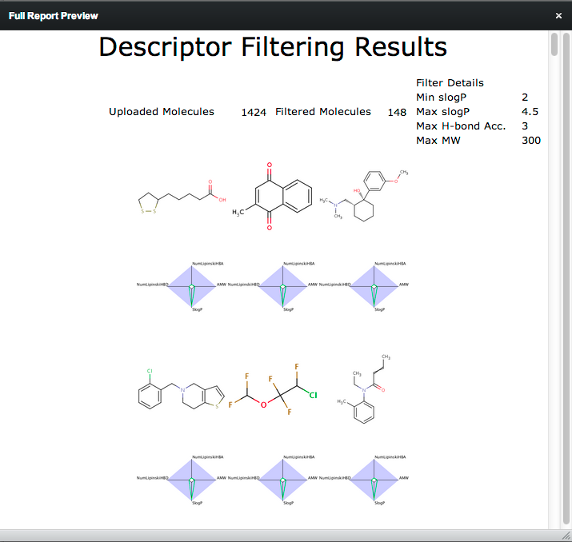 At the bottom of the pane the report can be previewed in a new window and is also available for download, either in PDF or XLS format, as PowerPoint presentation or as Word document. If the user launches long-running jobs on the server through the WebPortal, the user can logout and come back any time later, re-connect and get the status of his jobs. The jobs can be canceled, or finished jobs can be inspected and the results can be downloaded. The job (and all its results) can be discarded by clicking the "Discard" button. Its icon will disappear from the left Workflow Repository view and server resources will be freed. Jobs can also be discarded by right-clicking on their icon in the Workflow Repository (on the left). All jobs of a flow can be removed by right-clicking on the flow. Please note that jobs stay in the server’s main memory until they are discarded. If too many users keep too many jobs alive, the server will run out of memory. The settings page allows one to change the password of the currently logged-in user. It can be accessed via the "Settings"-link in the upper-right corner of the WebPortal’s main page. If a workflow contains legacy Quickform nodes and no regular Quickform or Wrapped nodes it will still be executed in the same manner, as in previous versions of KNIME Server. 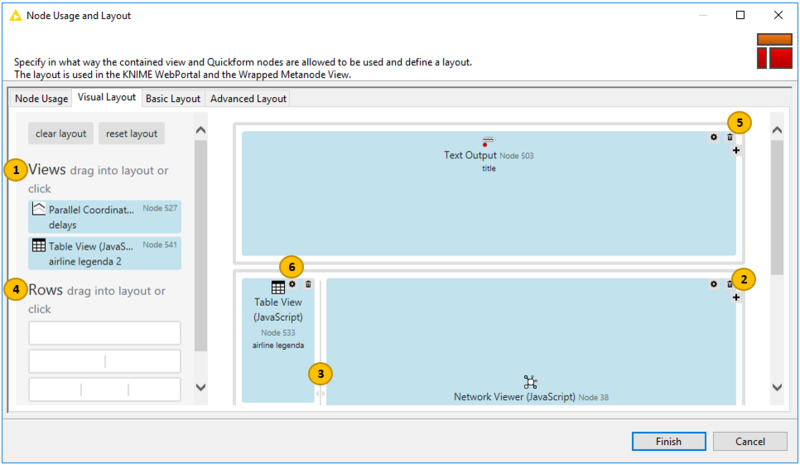 Please see the WebPortal User Guide for KNIME Server 4.1 for documentation on the nodes and execution behavior. Note that legacy Quickforms will have to be separately installed on the server executor and any client designing or executing legacy workflows. The plugin is found under KNIME & Extensions → KNIME Quick Forms (legacy) in the "Install KNIME Extensions" dialog. KNIME WebPortal provides full support of screen reader software as well as complete keyboard-only access. Any screen reader that follows ARIA guidelines can be used for the work in the WebPortal. The recommended screen reader software includes JAWS (v.16), NVDA (v.2016.3) and ChromeVox (v.53.0.2784.1). Tab (Shift + Tab) key moves the focus to the next (previous) element. Enter key performs the default action on focused element. Up arrow and Down arrow keys move between the tree nodes. Left arrow key on an expanded node closes the node. Left arrow key on a closed or end node moves focus to the node’s parent. Right arrow key expands a closed node, moves to the first child of an open node, or does nothing on an end node. Enter key expand/collapse a workflow group or activate a workflow. Home key moves to the top node in the tree view. End key moves to the last visible node in the tree view. To operate with UI components of the WebPortal standard shortcuts can be used. For more details see the ARIA specification page. <ItemPath is the path to a workflow, workflow group, or workflow job. A workflow job is referenced with its ID like: WorkflowGroup/Workflow?exec=job_id. <WorkflowParameters> can appear in any order, but have to be after the <ItemPath>. Parameters are always appended with a leading &. &single — Single mode: hides the workflow tree, so that only the selected item is visible. &run — Auto run: If appended to workflow path, a new job is automatically executed. &root=<RootPath> — Set root of workflow tree: If set to a valid path, only items underneath the given <RootPath> are available. &pm:<name>=<value> — Set quickform parameters: Sets the named quickform parameter to the specified value. Please see more specific explanation about this feature on the following page. &emails=sample@mail.com — Enable email notification: enables email notification and sets the specified comma separated list of email addresses. &formats=<formats> — Set report formats: sets the report formats included as attachments in the notification email specified by a comma separated list. Available formats are: pdf (enabled by default), html, doc, docx, xls, xlsx, ppt, pptx, ps, odt, ods and odp. This list might have been changed by your server administrator to reduce the number of options available. &user=<username> — Set the user name for login to the WebPortal. Use in conjunction with &pw to automatically log in. &pw=<password> — Set the password for login to the WebPortal. Use in conjunction with &user to automatically log in. Please note that the password is transmitted in plain text. With the &pm-parameter it is possible to override the default value of most Quickform nodes. They are addressable by using the same name as the one set in the "Parameter name" field in the configuration dialog of the corresponding node. It is best practice to keep those names unique, however it is possible to address nodes, when there are multiple of the same parameter names in the workflow by appending the node id (e.g. param-name-32:34). There are a few nodes, which require a special format, which are listed in the following. Use yyyy-MM-dd’T’HH:mm:ss as date format, alternatively other ISO-conform formatting strings can be used to just address date, time or zoned date & time components. Use username:password as value. Please note that the credentials and user name cannot contain the "=" and ":" symbols and that the password is transmitted in plain text. © Copyright 2018 - KNIME AG - All Rights Reserved.